Metro board meeting attendees stand in support of Supervisor Hilda Solis’ motion directing Metro to broaden 710 Freeway South studies. Photo: Joe Linton/Streetsblog L.A.
Last week’s Metro board meeting agenda included numerous items, from bus service to Union Station run-through tracks, but the audience was packed with people mobilized to testify against Metro’s freeway expansion projects. There are two halves to the 710 story: north and south. Both critical battles pitting communities against numerous deadly impacts of outdated 20th Century transportation thinking. 710 Freeway South study area. Map via Metro. The metro board approved two items related to the southern portion of the 710 Freeway. The project is called the “I-710 Corridor Project.” It is located in Southeast L.A. County, extending from East L.A. to Long Beach. Metro studied widening the 710 South a few years ago, then concluded its environmental studies were inadequate, and need to be re-done, at a cost of over eight million dollars. Environmental justice organizations, including East Yards Communities for Environmental Justice, Communities for a Better Environment, and many others, have been pressing for a 710 South project alternative that only adds lanes specifically for port truck traffic, and instead of additional freeway widening, invests in walkability, bikeability, and transit. L.A. County Supervisor and Metro Boardmember Hilda Solis proposed a motion to expand the scope of the 710 South environmental studies to include zero-emission trucks, increased bus and rail service, complete streets, bike paths, and additional livability improvements. More than twenty speakers, many speaking in Spanish, addressed the board in support of approving the Solis motion. Residents of Long Beach, Cudahy, South Gate elaborated on the health impacts of 710 Freeway traffic. One speaker turned to the audience and asked attendees supporting the Solis motion to stand up; more than 50 people stood. County Supervisor Don Knabe proposed an amendment somewhat watering down Solis’ motion. Knabe’s amendment directs Metro to only study zero-emission trucks “should technology be available” and removes three bike paths from the EIR, directing Metro to study them separately. The board unanimously approved the Solis motion as amended by Knabe. Solis’ supervisorial district includes the 710 from East Los Angeles to South Gate. Knabe represents communities along the lower 710, including Long Beach. The 710 North is formally called the “SR-710 North Study” and informally called “the 6 billion dollar freeway tunnel under South Pasadena.” The SR-710 North was not specifically on the meeting agenda, but 710 opponents testified during the an item where the board received and filed the framework for a possible 2016 transportation sales tax ballot measure, informally called Measure R2.1. Numerous opponents cautioned Metro against including any funding for the 710 North in a future ballot measure. 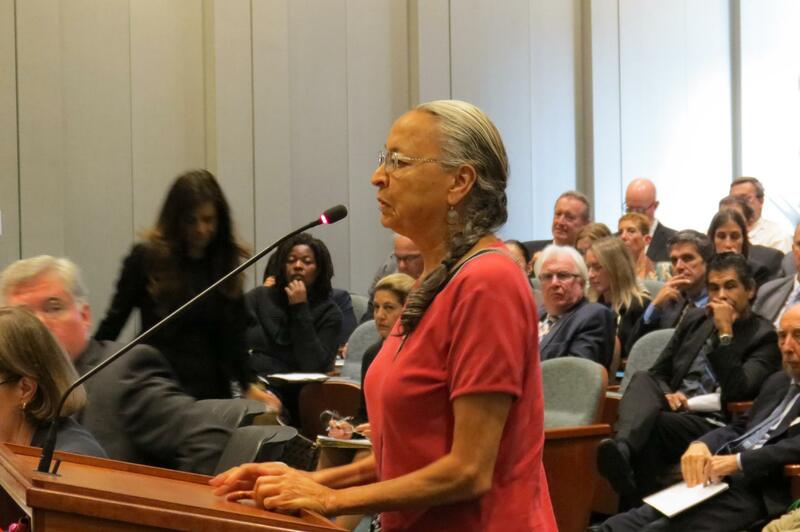 Speakers vowed to actively oppose any tax that would advance the 710 North project. Though there are still lots of negotiations before a final ballot measure project list is finalized, the 710 North project does not appear on the San Gabriel Valley Council of Government’s preliminary wish list. Los Angeles Mayor and Metro Boardmember Eric Garcetti asserted that he would not favor including the 710 North in a 2016 ballot measure. As most Streetsblog readers probably know, Metro included billions of dollars of freeway funding in Measure R to get it passed, under the assumption that L.A. County voters who drive would not otherwise support transit. Opposition to continued funding of the 710 North project played a role in the defeat of the 2012 Measure J. Should Metro tether a 2016 ballot measure to numerous outdated freeway-widening projects? Or could a Measure R 2.1 avoid these controversial freeway excesses of Measure R, and truly embrace a healthier more livable Los Angeles? If the Board is making its decision based on what is the best measure that they believe will get the most votes, the answer may not be as clear-cut as they believe. The wish lists for Measure R 2.1 don’t have any wholesale freeway construction – only “hot spot” freeway improvements, like connecting merge lanes or redoing offramps. The North County is requesting SR-14 widening, which makes sense given the bottleneck between Santa Clarita and Palmdale, and the South Bay requested an additional HOT lane on I-105, which makes sense given the congestion there (although they should try to increase the passenger count to 3, since the 2 person HOV lane on the 105 is often clogged with people picking up or dropping off at LAX and not “real” carpools). The unconstrained list for LAX has projects like a $1.12 billion LAX Expressway”, but that’s a wish list. The message delivered by the speakers at the Board meeting went beyond cautioning the Board not to include SR 710 in the potential ballot measure. Because the San Gabriel Valley COG did not include the SR 710 Project in its priority list, we understand that it is unlikely to be explicitly named in Measure R2. worthwhile projects anticipated to be contained in the proposed ballot measure, however if the SR-710 tunnel alternative is not removed from consideration once and for all prior to the November, 2016 election, we will work to defeat the Measure. across the bow — call it what you want. It seems to be the way things get done in government. That was not the only message we delivered. We were also there to support the proposed Performance Metrics Framework for the 2017 LRTP – a framework that includes admirable sustainability objectives such as reducing greenhouse has emissions, reducing vehicle miles traveled and improving the quality of life by addressing air pollution and public health disparities. In my view, the continued possibility of a tunnel that will impose the now well-documented significant, unmitigable impacts elucidated by EIR/EIS expert reviewers, including the EPA. SCAQMD and USC School of Medicine Environmental Health team, while at the same time touting the laudable sustainability goals presented in the framework is the height of hypocrisy. Board member Ara Najarian, in his remarks following our comments, hit the nail on the head when he emphasized trust in Metro as a major concern for the public. Although the SR 710 North does not appear on the San Gabriel Valley COG’s preliminary wish list and Mayor Garcetti said he would not favor including in the potential ballot measure, it could still be funded because of a loophole in the draft documents presented at the Board meeting Thursday. It’s like the zombie, vampire project that won’t go away. After 65 years, it’s time to kill it once and for all. If the opponents have to threaten and then follow through with opposition to Measure R2, so be it. It’s not the $6 BILLION dollar tunnel/s under South Pasadena, it’s actually, according to SCAG, $11.8 BILLION. But, what’s a few BILLION here or there Metro says!!!!! You don’t speak for the majority of us and it’s unfortunate people like you add to the problem. Many of us will be supporting the tunnels!!! The people voting against the tunnel alternative and pushing for more “walk ability, bikes, and transit” will be the same folks rising up against developers who build more dense, taller, mixed-used projects. This is why the region continues to fail – social and environmental advocates who push their ideologies and agendas on everyone else without considering the fact that cities operate on multiple dimensions and not just on the ones they deem more fitting to their lifestyle. And what are the millions of hours from countless commuters wasted in traffic translate to? I say billions of more dollars in wasted productivity when you consider decade after decade of traffic congestion! Traffic will continue to increase in the region, regardless of a tunnel or not – that’s a fact. What we need to do is address the issue so that it mitigates current traffic conditions and absorbs future traffic increases. Not only do we need these tunnels, we need more dense mixed-use communities along mass transit corridors that will enhance walk ability and decrease short trip commutes by car. No where in my post did I claim to speak for anyone except the 225 signers of the letter presented to the Metro Board and the over 3400 signers of a petition asking to have the tunnel alternative removed from consideration. I respect your right to support transportation options you see fit and I ask that you respect my right to do the same. There is a bit of irony mentioning “threat” in your post and then asking for “respect” in your response. @antiqueshopper:disqus could you give us a link to the source of that $12B number? To be fair to both opponents and supporters, we really have no clue how much the tunnel will cost until you do a full engineering analysis, which can only happen once the tunnel alternative is developed fully in the environmental document. You are correct that it will take a full engineering analysis to come up with a cost, but that will be a minimum — a best-case scenario. Bent Flyvbjerg’s analysis (and that of others) on infrastructure megaprojects, shows that 90% go over budget and schedule. The average cost overrun for bridges and tunnels is 34%, and some have been as high as 300% over budget. This is one of the factors that makes the cost-benefit analysis released by Metro so laughable, but it has many other shortcomings as well. Unfortunately, the DEIR/EIS stated that further engineering and air quality studies will only be done if the tunnel emerges as the preferred alternative so the public will never have a chance to have a clear understanding of the costs — fiscal and environmental — until it too late for them to have a say in the matter. The 710 South community raises legitimate environmental justice issues. The ports and freeways in the area now are already causing unacceptable levels of pollution that is disproportionately impacting the poor and people of color. We should get creative with the “highway” money. If it were directed to freight rail, Metrolink or grade separations it might actually do more for traffic congestion than freeway widening, which creates new demand for driving. Why not direct some grant money to local governments planning transit oriented affordable housing? We can’t ignore the inextricable link between land use and transportation. We can’t keep planning roads as if climate change doesn’t exist. The 710 North project is offensively wasteful of tax dollars. To spend billions of dollars just to get a couple of lanes seems like a parody of government waste, not a serious transportation project. I cannot supply a link. I sent you the report via email. how about just finishing what’s already been started like the 605/10 overpass? I see no indication that those stating they will oppose a Measure R2 if it includes a 710 freeway extension would vote for a transportation sales tax measure that doesn’t include money for a 710 freeway extension. 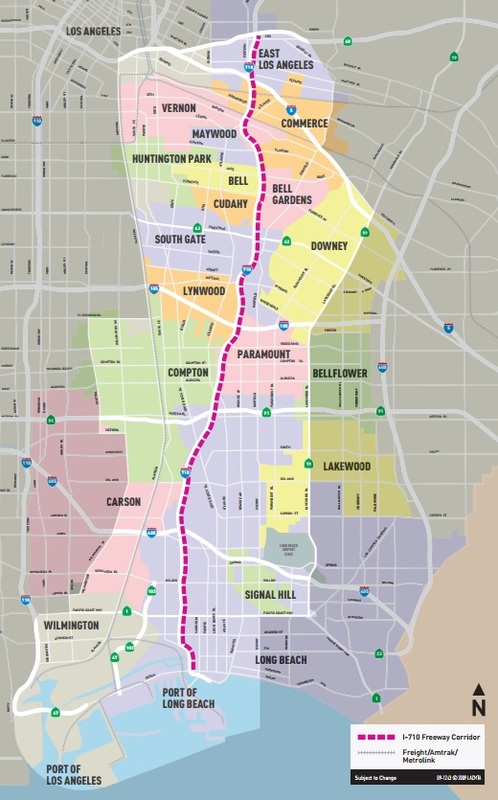 Its very unlikely that a Measure R2 would include another light-rail project in the areas opposing the 710 extension, which leaves few options for spending much of the Measure R money in those areas. That in turn gives little reason for people in the areas opposing a 710 extension to vote for more sales tax for transportation if there is very little of that money will be spent in their area. $6 Billion would build 6,000 miles of Protected hike lanes in SoCal. because adding lanes always Eliminates congestion ? That’s a leading question fallacy and I never said anything about congestion being “eliminated”. Those are your words coming out of your mouth. Tunnels will MITIGATE current traffic congestion and regardless if that induces demand, the overarching concept that we must embrace is that our economy is growing. This will include more people and more traffic. You cannot deny that nor will you ever stop it now or the near future. The only zombies are NIMBYs who just complain about any large project and continue to dream the issues will just go away. They are zombies because they say NOTHING about other meaningful alternatives and throw in cheap unrealistic options like more green space and bike lanes, as if that will solve everything. Lots of people will be supporting R2! For your information, viable non-highway, multi-modal alternatives have been proposed for the 710 corridor which, at a considerable fraction of the cost of the surface or tunnel alternatives, relieve congestion. The reason Caltrans has never been able to build the project is that there has been an injunction in place since 1973. Have you read the DEIR? The tunnels do not relieve congestion. Traffic increases in Alhambra as does air quality impacts, not to mention the environmental justice issues in El Sereno (LA). “Canard/not in any official document,” really! The SCAG Matricies, which includes the $11.8 cost estimate for SR 710 tunnels, is an official document resulting from a workshop during the 2008 RTP process. Whichever staff person produced that number, the most realistic so far, deserves a medal for honesty, unlike the current Ex Director Ikrata and Metro staff that are off by half. As stated before, what’s $4-5 Billion hear or there. Please, enough with this “environmental justice” issues in El Sereno. That’s just a marketing propaganda to sell your complaints. If that’s the case, there is environmental INJUSTICE now in Alhambra with residents being bogged down in traffic on Fremont Ave and constant accidents occurring near there. Yes, I read several sections of the DEIR. I live near the proposed tunnels and IT IS NEEDED! The quality air impacts will be worse if more traffic is just jammed into old freeway networks and average speed just continues to lower. You’ll just have millions of cars idling every year instead of better overall movement with the tunnels added. NIMBYs must also embrace mixed-use projects that are denser AND TALLER to capture the efficiencies of dense transit-oriented communities. Of course you’ll be probably be against those too! Sorry, you’re a day late and a dollar short. Alternatives have never been a serious thought for the communities near these proposed tunnels. For decades South Pasadena, Pasadena, and even South Alhambra have opposed taller and denser mixed-use projects that make walkability, bike lanes, and light rail more effective and feasible. Alternatives should have been incorporated years ago but that would have meant more dense communities that make mass transit ridership levels more realistic and financially sustainable. Of course there NEVER WAS NO PLAN, because NIMBYs always wanted to preserve the status quo. Now that these tunnels are coming back up again, all I hear are cheap excuses to bring back “alternatives” which really have no meaning as it never had in the past! Why not spend the $6 Billion creating 6,000 Miles of Protected bike lanes instead ? You Wanna move people and Support economic growth ? 6,000 Miles of protected bike lanes is going to do a lot more to support economic growth than a itty bitty tunnel. Alexander, do you even know the how many commuters will be using the tunnels annually? Far more than the number of bikers using bike lanes. The economic impact will be tremendous. Itty bitty tunnel isn’t so itty bitty with the NIMBYs. 6,000 miles of protected bike lanes is not impressive when you consider our current infrastructure we have. Look at many stretches of San Fernando Valley (Reseda Blvd) and San Gabriel Valley (Rosemead Valley) whose bike lanes are dead zones save for a few occasional bikers during certain time periods. As I said before, bike lanes are best in DENSE MIXED-USE environments. The masses will not use them if you still have to travel far next to parking lots, gasoline stations, and non-walkable areas. You want bike lanes? Focus them on the denser areas. Granted this is a focused on a dense location NYC but there is plenty of density in LA. That these networks would be able to support. Should we be supporting projects that completely go against our stated long term environmental and transportation? 6 billion dollars can get you a lot more than bike lanes, I’d want it to support more and better walking facilities, station area improvements and more. Should we be tying up the majority of SGV transportation resources for one mode of transportation that will have negative long term impacts and simply reinforces the status quo?